I love getting mail from readers, especially when they include ink samples they want reviewed. A very kind reader sent me two fun inks recently so today we are going to take a look at the first ink, Diamine Smoke on the Water. You can find this ink on Amazon or at Fountainfeder in Germany. 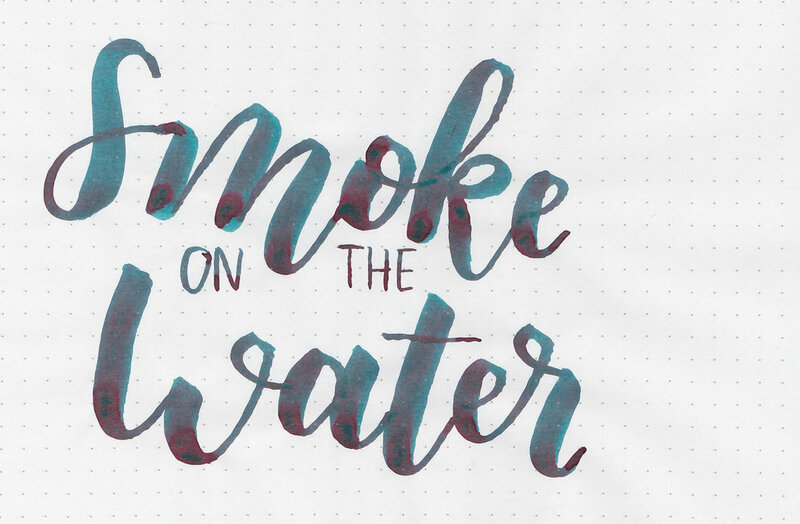 Smoke on the Water is a pretty dark teal with lots of sheen. In large swabs you can see a little bit of the base color and a lot of the pretty pink sheen. Other properties: no shading, monster sheen, and no shimmer. Any shading there might be is hidden under all the sheen. On Staples 24 lb copy paper there was feathering and bleeding in the large nib sizes. Krishna Sea at Night and Organics Studio Santiago Sea Blue both have similar sheens to Smoke on the Water, but Colorverse Gravity Wave is closer to the base color. 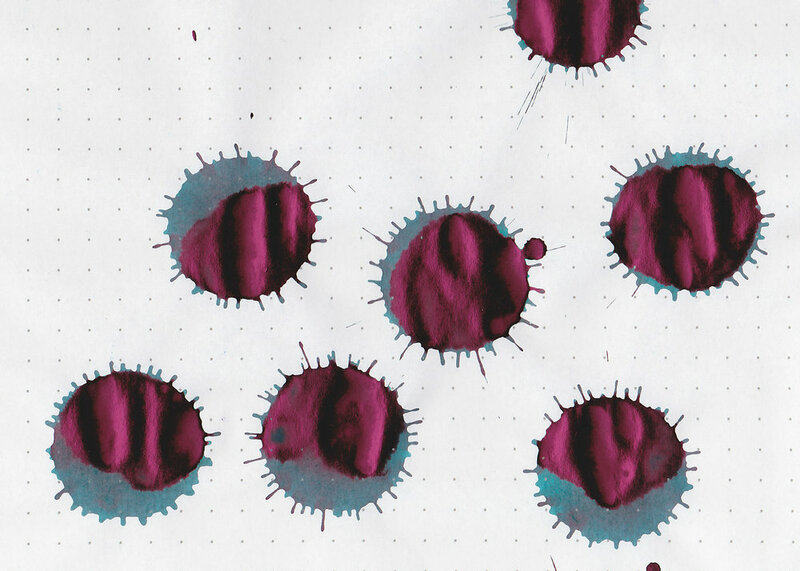 Click here to see the teal inks together, and click here to see the Diamine inks together. I used a Pelikan M600 Turquoise with a broad nib on Tomoe River paper. The ink had an average flow. Overall, I was rather impressed with this ink. It’s a monster sheener but I didn’t have any trouble with it smearing. 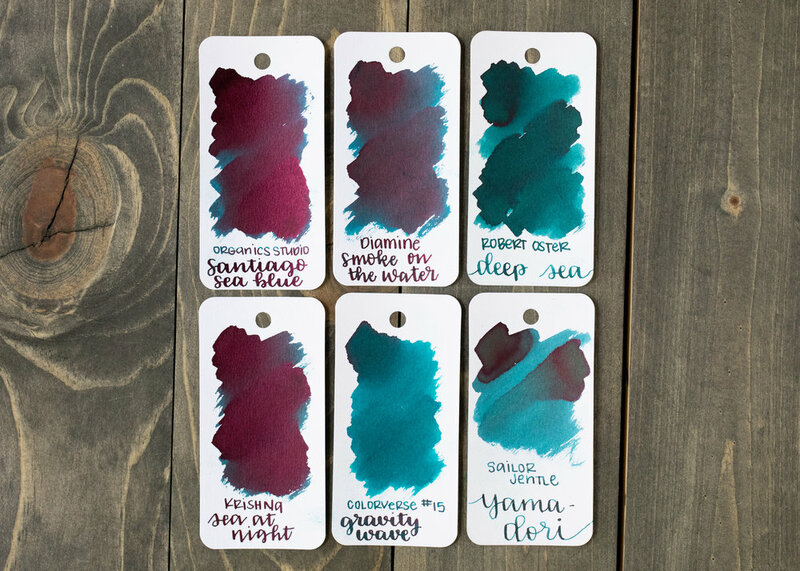 It’s a great option if you are looking for a sheeny teal ink. Disclaimer: A sample of this ink was provided by a pen friend, and all photos and opinions are my own. This page does contain affiliate links, but this post is not sponsored in any way.